The men are lined up against the wall, checking their cell phones or glancing up at the clock for the time. Weigh-ins are supposed to begin at 6 pm and it is only a few minutes after 5. They are surrounded by a huge collage of photos that stretch across all surfaces of the academy, illustrating the legendary fighter Renzo Gracie and his family. Mark Anthony Marrero closes his eyes and allows his body to slump back, resting himself on part of Gracie’s face. Only a few moments have passed since Mark initially shut his eyes, but he opens them again and leans forward. Around him is lots of chatter to pass the time. Fight week creates a very different atmosphere in the academy. His teammates greet him with “Good luck!” instead of “Hello”, he’s been suited up in sweats instead of Thai shorts, and every drop of water or bite of food has to be accounted for. A different coach is teaching class this evening because the head instructor is going with Mark to the weigh-ins. His mother Toni is there, sitting quietly and watching a few of the students warm-up for class. Even though it is a brief interruption in the day, it’s like they are all living in a different world. It was Mark’s mother who initially got him involved in the sport. Nearly seven years ago, she had wanted to start cardio kickboxing and roped her then-22 year old son into coming along. A baseball player with no martial arts experience, he became hooked. Marrero soon transitioned to train Thai boxing after a few months of doing the classes with her. She’s gone to every single New York fight ever since. The petite woman has to look up when she talks to her son, but has a fiery personality when discussing his fighting. The time has finally come to leave the academy and go to the weigh-ins. Marrero’s normally full face looks gaunt, even with what is hidden by his beard. He didn’t have a difficult time cutting weight, but still–he’s hungry. The team field trip has started as he leads the way, flanked by his coaches and teammates. Another teammate, Chris Borders, is also fighting, and the two walk in silence as their coaches talk over their heads. Toni walks behind Mark as she follows the procession. Marrero isn’t a person that’s too complicated. Friendly, sarcastic, and with a voice that can be heard over anyone else’s, he stands assertively when being coached and doesn’t look down when he makes a mistake. While he’s talkative and a jokester off the mats, he means all business when he’s training. “I know how to be friendly, but when it’s go time, I’m focused,” he had said firmly. Wearing a black hoodie and grey sweatpants that were blotched with his sweat, he shook his right foot as he spoke, slightly uncomfortable with being scrutinized. Despite having a witty retort for most occasions at the academy, when it comes to himself, Mark doesn’t like to be the center of attention. Back at The Garden, Marrero follows his coaches through the metal detectors as they enter the building. With nothing in his pocket but his cell phone, he walks through easily. One of his coaches however, has brought his camera and is having a harder time. “Just leave the camera behind!” Mark says jokingly as his coach is now being wanded by a security guard, after walking through the metal detectors three times. He waits patiently however, and pats him on the back when his coach finally makes it through. The team follows coaches Joe Sampieri and Jamie Crowder to an escalator, where they are stopped again by another security guard. Despite the delays, Marrero is still in a good mood. He’s more concerned about his teammate Chris and how he is feeling, rather than his own hunger. Marrero had came to Renzo’s only a year and a half ago, after training for several years at CROM Physical Culture. 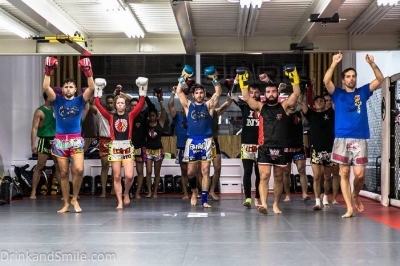 He was well-known in the Muay Thai scene and friendly with many fighters, as he had been fighting for some time while working Friday Night Fights shows, but wasn’t sure of what to expect when he stepped into Gracie’s academy. The men have finally made it into the weigh-in room and it is deathly silent, almost as if a wake was being held. It wasn’t unusual for a space where over thirty hungry and dehydrated fighters were scoping each other out to be so quiet, but as always, Mark’s voice rung out. “Ma, find us some seats so you don’t have to wait in line while we check in.” Toni nods her head and walks towards the back. Marrero stands next to his coaches as he pushes back his Roots of Fight Muhammad Ali baseball cap. The Renzo Gracie Muay Thai sweatshirt he’s wearing is too big on him today, but he’ll fill back into it within a few hours. His record of 10-4 didn’t come easily. Marrero won the WKA 147 lb Novice division in 2014, while still playing baseball and winning the championships with his team. Since then, he picked up the USMTA Welterweight title at Warriors Cup and has competed and won at various tournaments in the United States. Fighting isn’t the only thing he does however–Marrero also works two jobs, one of which revolves around children with special needs, and is still in school. Even with a full-time training schedule, he doesn’t look for excuses to get out of his responsibilities. The fighters continue to check in as Marrero finds his mother in the back. The room has gotten slightly louder as teammates find each other and coaches congregate to discuss recent fights. Marrero’s coaches follow him and sit on opposite ends of the table with him in the middle. He drums his fingers on the wood as his teammates talk, occasionally laughing at something they say. To his left, Chris is quiet and in his head. Mark reaches out and puts his hand on his shoulder, and gives him a nod. Chris nods back and smiles. The guys only have another hour to go before they can eat. They have their plastic bags full of food just a few inches away from them, but they’re set under the table to be less of a distraction. He would know better than anyone else. A constant figure at the academy, the only times he doesn’t appear is when he’s traveling, and they’re always for brief periods of time. Every several months, Marrero might leave on a Thursday and appear again on Monday a lot tanner and more relaxed, but his life primarily revolves around his teammates. After all the fighters have checked in, a referee stands at the front of the room and goes over the rules of the event. As he speaks, Mark faces forward and listens intently, despite the fact that his opponent is only ten feet away from him. They are the co-main event on the card, but neither seem too pressured. The weigh-ins have finally officially begun, and each fighter is called out to take their place on the scale. Most only wearing their undergarments, they dutifully they walk up, and step on the silver square. Mark will be one of the last to go, but he stands next to Chris as the two men wait for their turn. Toni has taken her place at the top of the stairs, where she would be best able to get a picture of him. She’s quiet again, and holds her phone up at the ready, afraid to miss a moment of the experience. For as tough of a guy that Mark is, with all the rough parts that make him into the person that his team knows and loves, when he talks about his mother, his face visibly softens and his sardonic demeanor fades away. When Marrero had won his belt at Warriors Cup earlier this year, after hugging his coaches, he leaped out of the ring and ran off the stage, still in his Thai shorts with his hands not yet unwrapped, holding his belt. He jumped into the audience and ran past bystanders who were trying to congratulate him, to the corner of the room where his mom had been sitting. She ran towards him and embraced him into her arms. He handed her his belt and even from afar, it was clear she was emotional. It’s finally Mark’s turn to weigh in. As he steps on the scale, his mother holds her phone steady and nods jubilantly as he makes weight. He faces his opponent and looks fierce, not afraid or tired or hungry. “He’s ready for this,” Toni whispers to herself. After taking pictures, the guys are finally free to eat and begin their small feast. Mark is sharing his watermelon with everyone around him while devouring a bagel. “Food tastes really good today!” He says with his mouth full, to his coaches’ laughter. He’s finally done with the worst part of it and can now look forward to the big show. As the team leaves Madison Square Garden, Toni nudges Coach Joe and says, “The official says that no girlfriends or friends are allowed in the back room when they’re getting ready to fight, but he didn’t say anything about mothers!” They all laugh as Mark shakes his head. “Don’t give her any ideas, otherwise I’ll find myself with a fourth cornerman!” He puts one arm around his mom, the other hand clutching a bottle of red Pedialyte. As they walk towards the exit, they pass a photo of the Puerto Rican professional boxer Miguel Cotto celebrating one of his many triumphant wins at The Garden. “Alright ma, whatever you say,” Marrero says with a smile, and dutifully stands next to the photo, just as he had followed her to cardio kickboxing classes all those years ago. He gets into his fighter pose and puts his fists up, but notices his mother is just standing in front of the picture and has her arms down. “Come on ma, you have to put your fists up too. We’re in this together, you and me,” he says to her, tapping her hands and gesturing for her to lift them up. “Okay, okay,” she says excitedly and grins, as she clenches her hands and holds them up in front of her body while the coaches take their picture.